Drawing trend lines is an art form that can take awhile to master. That's because everyone has their own unique way of drawing them. There is no perfect way to draw them and it seems that no one can agree on the best way! What is the purpose of drawing trend lines? The purpose of drawing trend lines is to identify where possible reversals will take place. They can also signal that a change in trend may occur. In a uptrend, draw the line along the lowest points in the trend without letting the line cross through prices. You need at least two touches of the trend line. See also: This is how a simple line can improve your trading success. That is the proper way to draw a trend line. You can see how the stock found support near the line after we got a least two touches. That would have been a great opportunity to establish a position in the stock. You can see in this chart of QQQQ, that there was a trend line break but it did not result in a change of trend. Just because a stock breaks that line that you drew, does not mean that all of a sudden the stock is going to tank! On this chart, you can also see how a stock can often run into resistance near a trend line, if it is broken (top of chart). After the first trend line break, we discovered that a change in trend was not going to occur, so we drew another one at this point. After that, we would just wait for another touch of the line and look for a reversal pattern to establish a position. 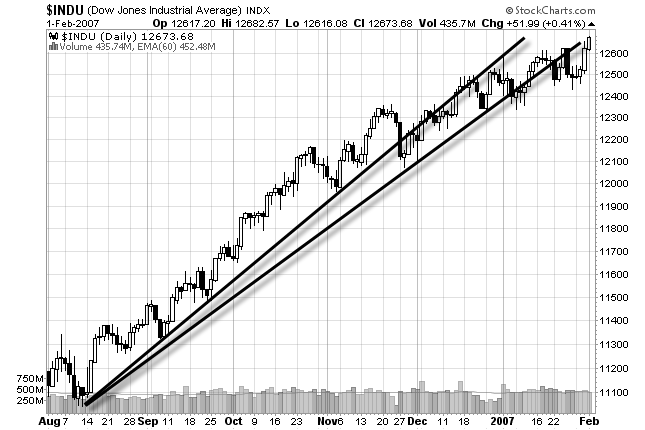 The more times a stock touches a trend line, the more significant it becomes. It takes two touches to draw a trend line, but 3 to confirm it as being a valid one. 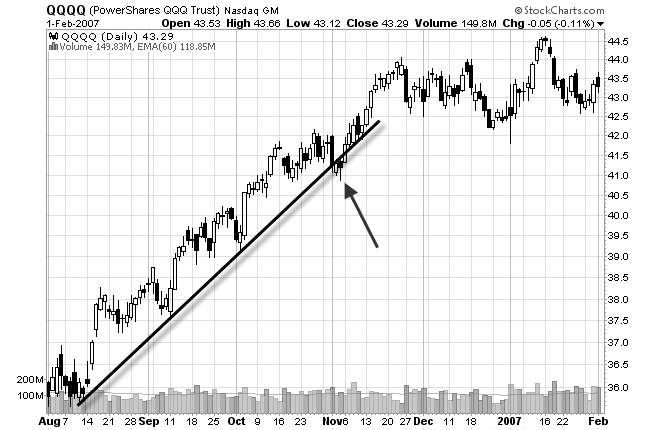 In a down trend, draw the line along the highs of prices. The steeper the trend line, the less reliable it will be. A trend line break does not mean that the trend will change. I have a confession. I don't draw trend lines very often! After you have looked at thousands of charts, you can see them without having to actually draw them in. 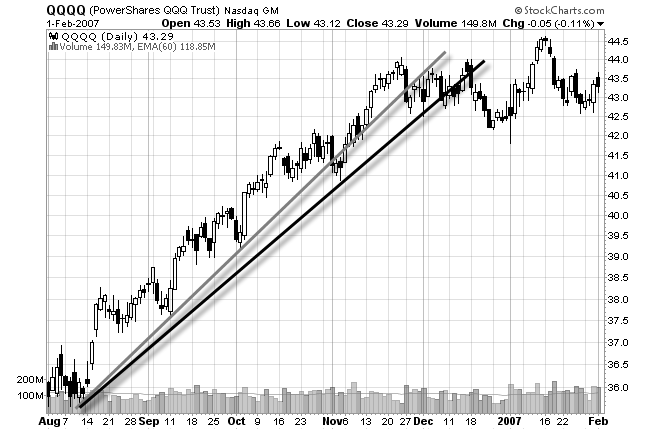 And I certainly would never buy a stock just because it is hitting a trend line. They are just a piece of the puzzle.